The Carolina Dog is a pariah type wild dog found in isolated forest and swamp lands in South Carolina and Georgia. They are also referred to as "American Dingos" due to their uncanny resemblance to the Australian Dingo. It's hypothesized that this is the oldest American Dog breed, however, these canines are surprisingly adaptable to life with people. They are quite suitable for families and do well with children and other dogs. 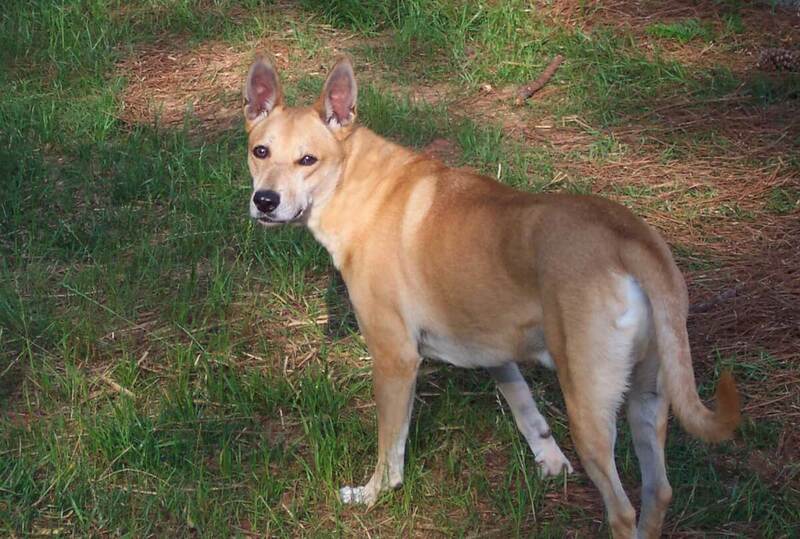 Carolina Dogs are low maintenance, easily trained and non aggressive. Although they may remain reserved around strangers and aloof, in general, they are are affectionate in their own way and bond closely with their "pack". Time to socialize and exercise them is a must. This breed has few (if any) common health concerns and may live up to 15 years. 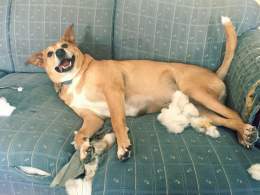 The Carolina Dog, or American Dingo, is a wild pariah-type dog that is currently found mostly found in the Southeastern United States, especially the South Carolina-Georgia area. What is unique about the breed is that that are exclusive from any European lineage and scientists postulate that it is America's oldest breed, initially crossing the Bering Land Bridge with Paleolithic migrants over 10,000 years ago! Leader of these hypothesis and discoverer of the breed, Dr. I. Lehr Brisbin furthers the acknowledgement of the dog he dubbed the "American Dingo" due to its close resemblance to the Australian Dingo. These dogs are now UKC and ARBA recognized. America's oldest breed, the Carolina Dog, is a medium-sized wild dog that appears very similar to the Australian Dingo and the Korean Chindo-kae. They look very typical of the pariah/wild dog (according to the UKC and ARBA) with a lean body that displays a deep chest and tucked belly. Their ears are large, pointed and erect and almond-shaped, obliquely spaced eyes that portray a reserved gentleness. The short, dense coat comes in a few color varieties (see color section) but is most often some shade of red-ginger. 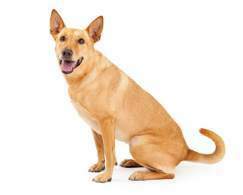 Carolina Dogs have a long, hooked tails they use for signaling to one another. 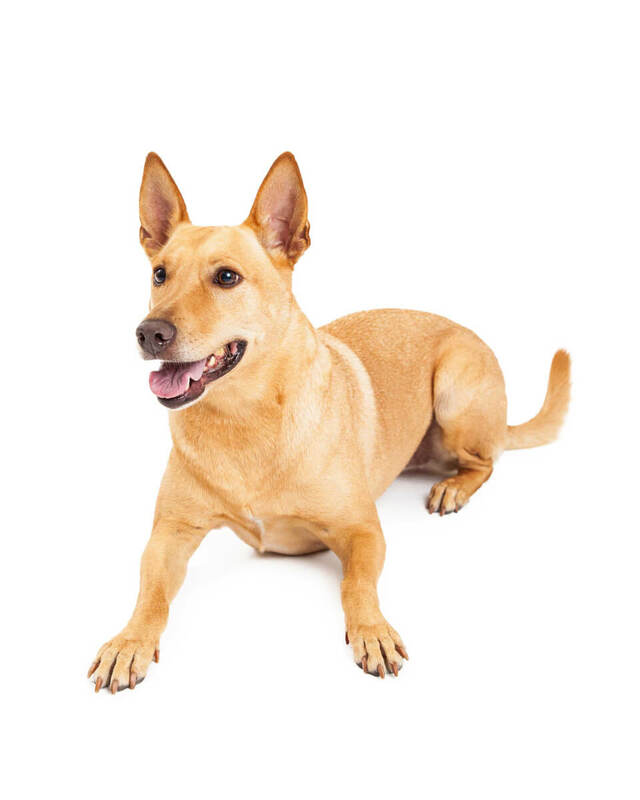 Most information on the Carolina Dog is in agreement that this dog is both adaptable to living with humans and fairly easy to train. They respond well to gentle commands and praise and are notably easy to housebreak. If entering as a puppy into a household with multiple dogs, CDs are typically submissive-- either way this breed is almost never aggressive. This breed is a pack dog that will bond affectionately with their owner or family, although they may appear aloof much of the time. Understandably, they often remain suspicious and reserved around strangers. They are great with kids and friendly with other dogs, perhaps even cats (if very well socialized); they may retain prey instincts towards other small pets. Interestingly, the males of this breed share the responsibility of raising puppies with the females. Members of this breed can make appropriate indoor dogs, as they are relatively calm and quiet, however, they still have moderate exercise needs that must be taken care of daily. It would be appropriate to have a large fenced yard and they are not suited to apartment life. 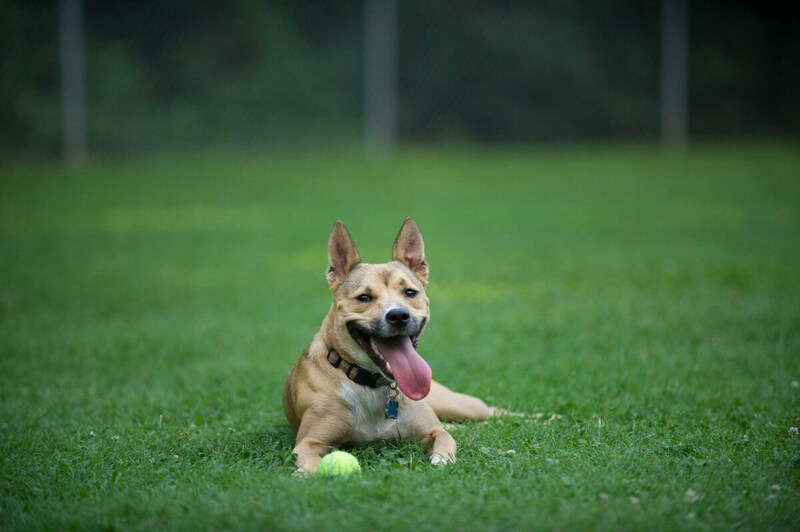 Small animal hunting, hiking, long walks, agility training, games and yard time are all good activities for a Carolina Dog. 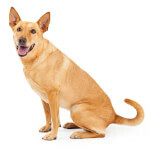 The short coat of the Carolina Dog is often black, black and tan, red-ginger, buff, wheaten and piebald. Shades of red-ginger are the most abundant in the CD coat. Lighter shades and white areas are usually found on the belly, chest, throat, sides of muzzle tip of the tail, and toes. Typically, this breed is not predominantly cream or white except in the case of Piebald individuals. In these cases the coat should be more than 50% cream/white with large spots of only 1 color (either red OR tan OR black). Dark coloration over the back, hindquarters and tail is also not uncommon. Some puppies have a darker muzzle or mask that may fade. This breed has had very little shaping by humans and, therefore, is not yet being bred to meet perfect size standards; even the ARBA standard states that symmetry is of greater importance than meeting measurements. The Carolina Dog is medium sized, in general, typically weighing 40-60 pounds and standing anywhere from 17-24 inches at the shoulder. If you adopt a Carolina Dog from an agency or pound it may be harder to predict size; it makes it even harder that many unfamiliar with the breed (even veterinarians) will improperly label them as various mixes. Although the Carolina Dog doesn't thrive in urban areas like other pariah breeds, they are surprisingly in possession of personalities that make them very adaptable to living with people. They may remain reserved and even suspicious of strangers but, if trained and socialized as a puppy, the Carolina Dog temperament will be friendly, watchful and pack-oriented. Their behavior towards an owner/family is affectionate yet aloof and, though they are not lapdogs, will bond closely and do not prefer being alone. Members of this breed are good with children, other dogs and even cats (if well socialized), however, small pets like mice and snakes are likely a no-go. These dogs are generally quiet indoors but may alert bark, if necessary. The American Dingo temperament makes them easy to train (obedience, housebreaking). They are moderate energy and need moderate exercise (an hour or so outside, daily). They excel athletically and enjoy hunting small animals, long walks, hikes, games such as frisbee, and plain old playtime in the yard. 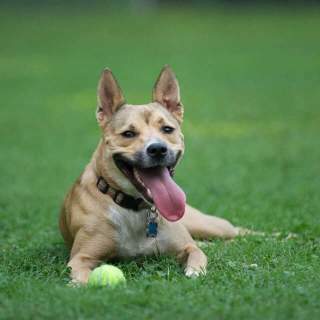 Below are pictures and images of the Carolina Dog breed. It's true that this is, so far, the oldest American wild dog breed; in fact, these "American Dingoes" are a pariah breed that has been shaped very little by humans. However, Carolina dogs as pets make excellent companions for individuals and families; although many biologists and nature lovers agree this dog should be left alone in its natural environment. Members of this breed are close to their immediate people but may remain suspicious or reserved around strangers-- those that have been socialized early are said to be more friendly. This pack dog bonds closely to its human family and is not the type to be happy without daily interaction from the "pack". They can live indoor or out, provided that need is met, and if kept outdoors you should have a large fenced yard (at the very least). Carolina dogs are not escape artists and, although they may dog holes, do not usually do so for the purpose of running off. These dogs are said to shed less and produce less "doggy" odor than some breeds, although they are not considered hypoallergenic. Carolina Dog puppies are usually easy to housebreak and train. They need moderate daily outdoor exercise (an hour or so is ideal). Note that females have several "cycles" per year. The American Dingo is an extremely healthy breed that may live up to 15 years. These Southeastern swamp and forest dwellers are considered pariah dogs, meaning they have been shaped very little (if any) by humans throughout the course of their evolution. Typically, the interbreeding of dogs over long periods to fit certain "standards" are what introduces diseases and disorders-- luckily this breed has not yet experienced that misfortune and there is no documentation of common health concerns!